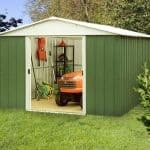 This is a strong and durable metal shed that has been especially created to look like a wooden shed. It is large and spacious, and we think it’s rather stylish too. There’s plenty of interior space in the 10 x 6 building, and an extra key feature is the fact you get a floor, which is not always the case. 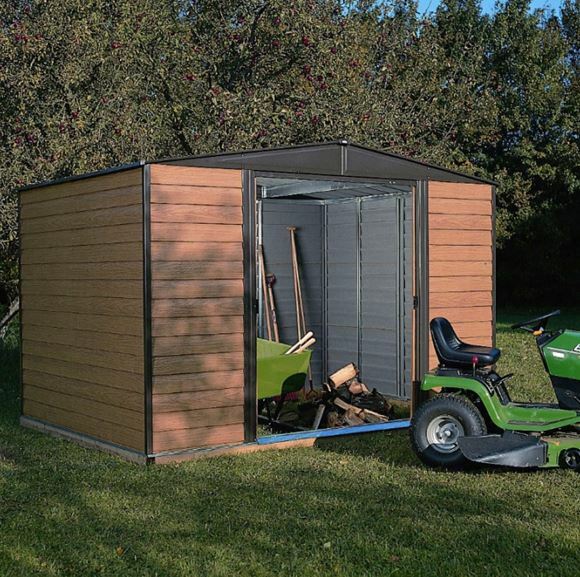 Well, we can’t fault the looks on this shed. The faux-wood effect works really well, and it has a pleasing appearance. We liked the fact it had a floor with it, because this is all too often not the case, and it is actually quite nice to have a floor. 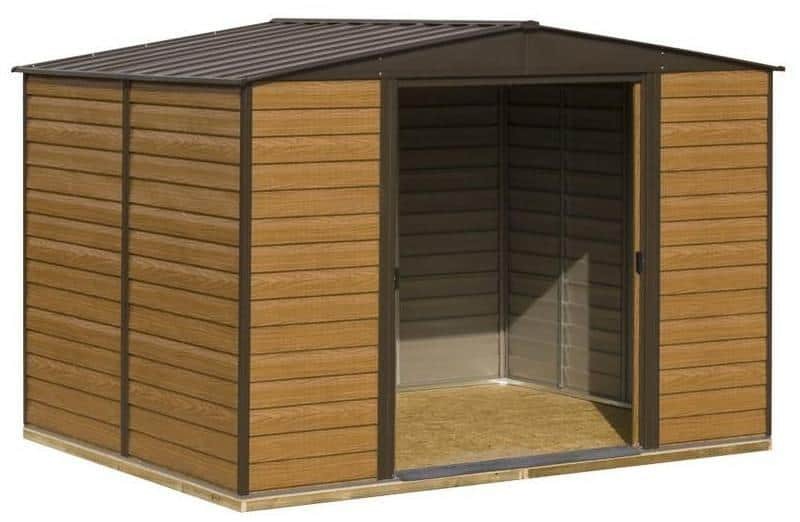 Other good features include the double lockable sliding doors, which open really smoothly, and are quite satisfying to use, actually. How durable is it? You name it, it’s protected against it. The nature of the building and how it has been created means that it is very much a durable building. It’s rust and rot proof, and it’s even rodent proof. Nothing can get to this building, which means it’s the perfect place for storing all of those important tools and pieces of equipment. The building has been galvanised, which means it is able to easily withstand rot and decay. And there is no chance of rust either. There’s even a 10 year guarantee against rust perforation. Can I build it myself? We don’t recommend that you try and build this on your own. There is a lot of work to be done here, and it easily takes two people (or more) to get it together in a few hours. It may even be worth your while getting the professionals in. In fact, if there is a downside to this building, it’s the hard work required to install it. What are the doors like? They are fantastic, a real feature of the building. They slide open easily, and they are strong too. 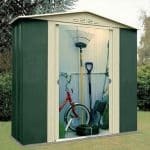 These doors are perfect if you have access issues, or you are simply struggling to store large and wide tools and equipment. And they are extremely smooth to open too. Any extras? 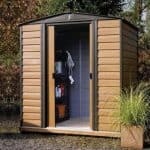 The building does come with a shed base and a shed floor. 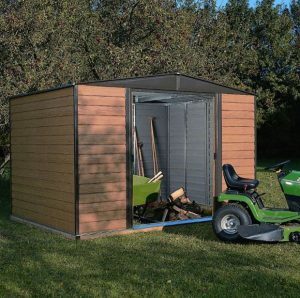 This is a real bonus actually, because it gives the shed a sense of completeness. The floor and base are sturdy and tough too. There is also a padlock door closure too so you can fix a padlock and have a secure building. 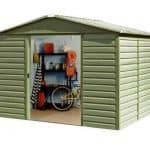 Base Rowlinson Woodvale Metal Shed 10 x 6: So what’s the quality like? You’re looking at a building here that is rock solid. 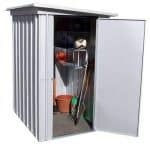 The galvanised aspect means that you have a building that will withstand rust, and the guarantee backs that up. But we really liked the fact that it stands up against anything. It’s secure, and built to last. 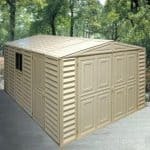 This is a great and spacious storage shed. you won’t find anything necessarily pretty in it, but the functionality cannot be faulted. It is strong, secure, and perfect for the storage of valuable items.